Lorain's first "light" was a simple lantern hanging on a pole at the water's edge. The first "light station", a wooden structure, was established in 1837 at the end of the West River Pier. Its beam was powered by lard oil, then later by kerosene. In the next 80 years, Lorain's light was rebuilt at least twice, with continuing repairs to the walkway to the light, until the outer harbor West Breakwater was completed in 1908. In 1939, the U.S. Coast Guard took over operation of the Lighthouse. In 1965, the Coast Guard decommissioned the Lighthouse. The building was slated for demolition in 1965 to make way for a planned $22 million harbor improvement program. The Lighthouse was to be replaced by a fully automatic light that would be erected at the west tip of the new outer harbor break wall. (The automated light was to be visible for 18 to 20 miles away compared to the Lighthouse's 15-mile range.) When the light beacon was installed in the new breakwater the Lighthouse's lens was removed and a small, red Coast Guard warning marker light was inserted in its place. The presence of the automated light released the three Lighthouse Coast Guardsmen for other duty. Unfortunately, the lack of staff being stationed at the Lighthouse ushered in a years-long period of intermittent vandalism at the structure. The building, without any furnishings in it, did not suffer any structural damage. The Coast Guard had to resort to welding the shutters and doors closed in an attempt to deny access to trespassers. A group of concerned citizens mobilized to prevent the demolition of the Lighthouse. Destruction had been scheduled for October 1965, but bad weather kept the demolition from proceeding. Since the weather stopped work on laying cable for the new beacon the old Lighthouse's beam was still needed. By the time spring arrived good news came: the Coast Guard had decided to retain the Lighthouse after all due to the community's interest in keeping the structure because of its historic value. In 1974 international attention was brought to the Lorain Lighthouse. The General Services Administration abruptly announced that the Coast Guard had turned the structure over to them and that the General Services Administration was accepting bids for its purchase. In 1977 the Lorain County Historical Society was awarded the deed to the Lorain Lighthouse by the General Services Administration for $1.00. The Lorain County Historical Society received the deed with the stipulation that the Lighthouse be maintained as an historic landmark. For the second time the Lighthouse had been "saved"! 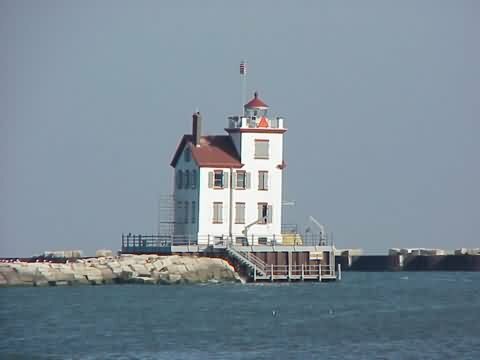 In December of the 1978 the Lorain Lighthouse was placed on the National Register of Historic Places. From SR-2 take the exit for Middle Ridge Rd. and head north on Middle Ridge Rd. In 0.3 miles you'll want to bear left and onto S. Broadway. Stay on Broadway for 4.3 miles (after 0.3 miles S. Broadway becomes Broadway, then in another 2.0 miles Broadway merges with SR-57 north). At the intersection with SR-6, take a left onto SR-6 (W. Erie Ave). In 0.4 miles turn right onto Oberlin Ave. When you get to the water treatment plant, turn left before it and go down to the public boat ramps. You'll see the lighthouse in the distance.